As Casual Runners are travelling from all of the world and descending on Walt Disney World Resort this week for the 2015 Marathon weekend, we decided that it was a good time to look back on the 2014 event. 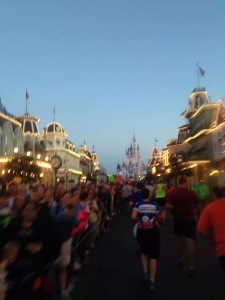 And do not forget to check out our review of the Walt Disney World Marathon Weekend Kids Races. Like so many other races, I did not choose this race, but this time, the race did not choose me. I never intended on running a marathon, ever. So how did I get roped into this one? I maintain that a very good friend of mine, Melissa, chose to take advantage of me at a vulnerable moment in order to get me to agree to run with her. She may tell it differently, but I am sticking to my story. When my brother, Frank, heard that I would be running a full marathon, I pointed out to him that the only way he could run a marathon before I did was to enter the same race and cross the finish line first. Before you knew it, we had the makings of a running group. And really, what better race to use as your first full marathon than the Walt Disney World Marathon? The granddaddy of them all. As it turns out, none of us would be travelling together. Melissa was heading to Florida early to visit family, and so she and I planned on meeting up in Orlando. Her husband Chris had to work, so he would be meeting us later in the week. My brother and his family were staying off-property and would meet us later in the week as well. Boy, that is a lot of meeting. My nephews will tell you that they made these sign, but their mom may have helped just a little bit. I flew down Thursday morning, met up with Melissa at the airport, and took Disney’s Magical Express to property. We stayed at Disney’s Caribbean Beach Resort, which is a nice resort, however, it may not be the most ideal resort for Marathon week as it is spread out (which results in lots of walking) and we were assigned a room on the second floor. That may not sound like much, but after running a marathon, #FearTheStairs is not just a hashtag, it is a way of life. The best part about the resort was that Melissa and I were able to do our shakeout runs at the resort, which offered us ample space, and jogging around the lake was very nice as it had plenty of space and great scenery. So this is all a definite plus for this resort. I knew most of the race course, but Melissa did not. So we spent Thursday doing a four-parks-one-day adventure, beginning with Magic Kingdom and ending with Illuminations at Epcot. We planned our park hopping to allow us to see and familiarize ourselves with a significant portion of the course. As long as you do not over-do it with walking, this is a great way to prep for the race. 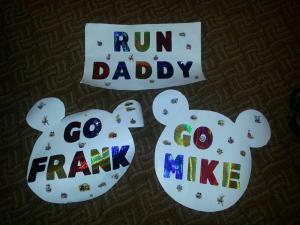 On the Saturday before the race, we took my nephews to the runDisney Kids Races. You can check out that full review here. We went to expo on Friday morning, after the conclusion of the 10k event. We were surprised by the number of 10k runners who went to the expo after their races, but there they were. As this was the first year for the Dopey Challenge (5k + 10k + half marathon + full marathon), the branding for that event was ever-present. Fortunately, I would never be so foolish as to try something like that (famous last words!). But I will admit that I was disappointed as, while I think any marathon, let alone your first, is a very big deal, the marathon really was overshadowed by the Dopey. In fact, the Goofy Challenge (half marathon + full marathon) was similarly overshadowed by the Dopey. The Expo was not at all crowded as all of the Dopeys, 5ks, and 10ks had already passed through earlier in the week. We had no trouble collecting our bibs and shirts and set about visiting the various vendors. It was a nice, relaxed expo experience. The only problem we encountered was there was a HUGE downpour. Expo veterans know you collect your bib in one building, then walk outside, up some stairs, and along the side of another building before you can enter the second building to get your shirt. We were caught in a big rain storm for this. Fortunately we brought our ponchos with us, but others were not so fortunate, and they got soaked. runDisney races are not known for swag besides the race shirt and finisher’s medal, which are always amongst the highest quality in the industry. Marathon participants received a nice Champion long sleeve tech shirt with the event logo feature the event host, Mickey Mouse. I also made a point of getting my art card from Lasting Commemoratives as I do for every race. Please note, they have gone over to giving out bookmarks instead of the traditional art card. It is disappointing as I really did want to collect and art card from every runDisney race I run. As my brother Frank was staying off-property, he decided to spend the night before the race with us at our resort. He put his boys to bed (they were ages 5, 3, and 3 months at the time), then their grandmother watched them while his wife drove him to our resort. We went to bed early, because the wakeup call was early. In addition to our multiple cell phone alarms, we used the resort’s service, and received a wakeup call from Olaf (it was in the middle of Frozen mania). As we had 3 runners in our room, we had prepared in advance a breakfast of bagels (with a toaster we brought from home), Chex Mix, iced coffee, Gatorade, and fruit. So everyone could fuel up in the manner that they preferred. I took a shower to help wake me up and we all got dressed and out the door to wait for the runDisney Shuttle to pick us up. We were glad that the lines were not nearly as bad as they were for the 2013 Princess Half marathon or what they would be for the 2014 Wine & Dine Half Marathon, so that was a good thing. We were soon on our way. runDisney are always better when they are shared with great running buddies. The marathon course has seen some significant revisions over its now 20+ year history, and the last time was for the 20th anniversary race. The starting line appeared to me to be nearly identical to the set up for the 2013 Princess Half Marathon, so you can check out that review for more details on the long walk needed to get from the shuttle buses to the corrals. I loved that my brother and I would be running our first full marathons together, but to be honest, Frank is much faster than me so I knew he would be starting in an earlier corral and I would not see him again until the finish. 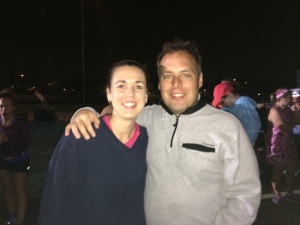 Melissa and I were in the same corral, but we had difficulty deciding on a race plan. We both very much wanted to run with each other, however I am very consistent in my pacing whereas she is a very strong back-half runner who tends to run negative splits. I was nervous about finishing my first full marathon, so we ultimately decided that we would start together but then run our own races after that. On a personal note. Melissa is one of my very good friends and we started our Casual Running journeys – quite by coincidence – together, so it meant a lot to me to be able to stand in the corral with her prior to toeing the line. We were both fine, really, until the National Anthem, and then…the emotion of the whole experience started to overtake me. Was I really about to toe the line at a FULL marathon? I couldn’t believe how crazy my Casual Runner journey had been to get me to this point, but I was about to do something I never imagined I would. And it felt exhilarating. With each successive round of fireworks denoting the start of the corrals in front of us, we grew more and more excited. It was a little on the cool side that morning so I had worn an old fleece which I tossed off just before the start (runDisney collects these clothes, launders them, and donates them to charity). TMI Alert. I visited the bathroom before we loaded into the corrals, but we had to wait so long for the race to start that I really had to go again. I saw an opening in the fencing and took my opportunity to duck off into the trees before rejoining Melissa for the start. And then, it was our turn. We started out on Epcot Center Drive and made our way to Magic Kingdom. There was the typical assortment of creative costumes amongst the sea of runners. The spirit and comeraderie of runDisney runners is like nothing else you have ever experienced in your Casual Running. Everyone really goes out of their way to be friendly and to make sure everyone is having fun and will succeed. Race Icon: Main Street USA on race morning. Race Icon. No matter how many times I see it, I will always be in awe. As we made the turn onto World Drive, the sea of runners was saluted by the monorails beaming back and forth on their respective beams. It is an awesome sight to behold and adds a little extra pep to your step. We crossed through the tollbooth to the Magic Kingdom parking lots and into the Ticket and Transportation Center, where I saw my favorite sign: “Have fun storming the Castle!” Its placement on the course could not have been any better. This section of the course leading up to Magic Kingdom, including the water bridge, realer were identical to the Princess Half, so you check out all of the details here. When we entered Magic Kingdom, I was surprised that the crowds were smaller than I had experienced during the 2013 Princess Half, however they were a far cry better than they would be at the 2014 Disneyland Half Marathon, as they allow the public to enter without park tickets before the park opens. Race Icon. Yup, the same magic was still there! Honestly, turning onto Main Street USA from Town Square was exactly as magical as I remembered it. It is spectacular in every way and the crowds were there to cheer us on, including my sister-in-law and nephews, but I could not find them amidst the raucous crowds. We turned right into Tomorrowland and made our way past New Fantasyland and the Seven Dwarfs Mine Train (which was not yet open at that point), before entering Cinderella’s Castle. This is why you pay the money to enter this race: exiting the castle into the Hub and taking in Main Street USA from that vantage point in the early morning light is absolutely breathtaking. We turned right into Liberty Square, ran along the Rivers of America, and then exited along the parade route in Frontierland. The backstage area is interesting as they had parade floats staged for us (with character stops) and we could see them working on the Splash Mountain rehab. Once you exit you hit the long, boring stretch of this course. But, surprisingly, this did not seem nearly as bad as it was during Princess. I have no idea why, but it was much better this time and not nearly as congested. This is the end of part 1, but please come back tomorrow for the rest of the review and, well, a few unexpected and unpleasant challenges that I had to endure and overcome during this race. Trust me, you have to hear the rest of the story.